The third phase construction of Rasela RPTRA, Rawa Badak Selatan Urban Village, Koja, North Jakarta that is in the form of permanent stage and park bench has reached 70 percent and is targeted to be completed this week.
" It is done in mutual assistance without using APBD"
Rawa Badak Selatan Urban Village Head, Sutardjo stated, after it is built since 2017, it has been developed several times. In the first phase, his party has spent Rp 100 million to make an elderly park. "It is done in mutual assistance without using APBD. And it's similar with the second and third phases," he expressed, Wednesday (3/7). 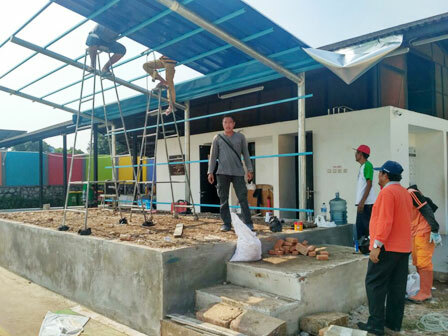 In the second phase, the Pojok Rasela construction is consisting of hydroponic house, multifunctional gazebo, pond and children's playground. "In the third phase, its construction is in the form of additional park bench and permanent stage," he explained. After it is completed, he would optimize the use of the stage for routine activities at the weekend. As planned, every Saturday night, RPTRA will be opened until 11 PM and held various events on the stage. "Residents who fill the event, can perform art or music entertainment. Hopefully this project can be completed this week," he hoped.